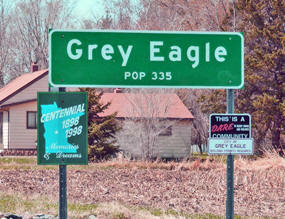 Almost smack dab in the middle of Minnesota lies a small town in Todd County called Grey Eagle. It has a population of only about 350, and is not really found near any major highways. But in this quaint little village, there is a magnificent structure which serves as the town hall. 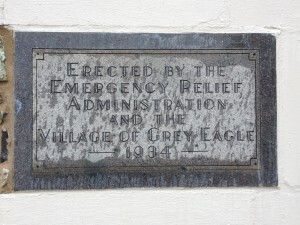 The Grey Eagle Village Hall was built in 1934 as part of the Emergency Relief Administration, a predecessor to the Works Progress Administration, which gave federal aid to states and put unemployed workers back to work during the Great Depression. The projects created hundreds of new buildings and structures in Minnesota (along with the rest of the US), many of which took on the detailed, hand-cut field stone architecture common of the era. On the front of the building is a plaque which describes its history. 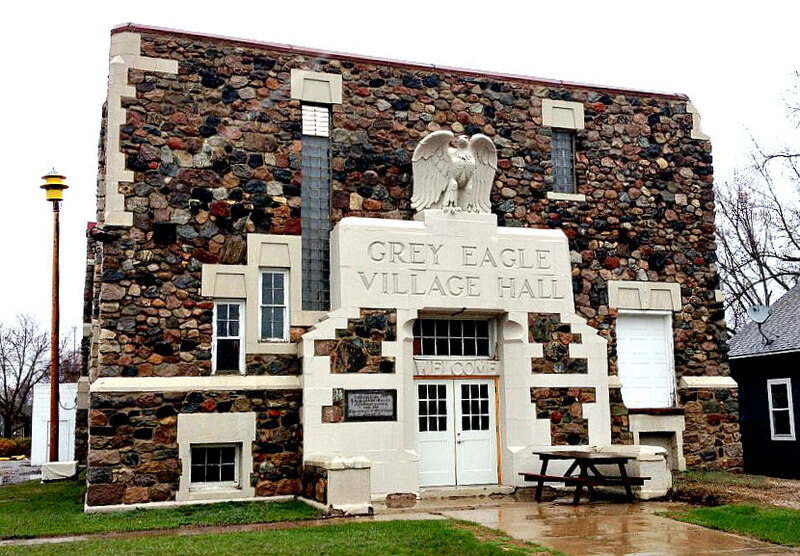 The Grey Eagle Village Hall is a classic example of the Art Deco movement popular around the 1930’s with rounded, blocky edges and Deco typeface on the facade. Above the door is a 5′ tall hand-carved eagle. The building, listed on the National Register of Historic Places, serves as the municipal town hall for the small community. Although I didn’t get to go inside, (it was locked when I passed through town on a Monday afternoon), it’s safe to say the most impressive part is admiring it from the outside. This is a classic hidden gem in a quiet, unassuming small town. 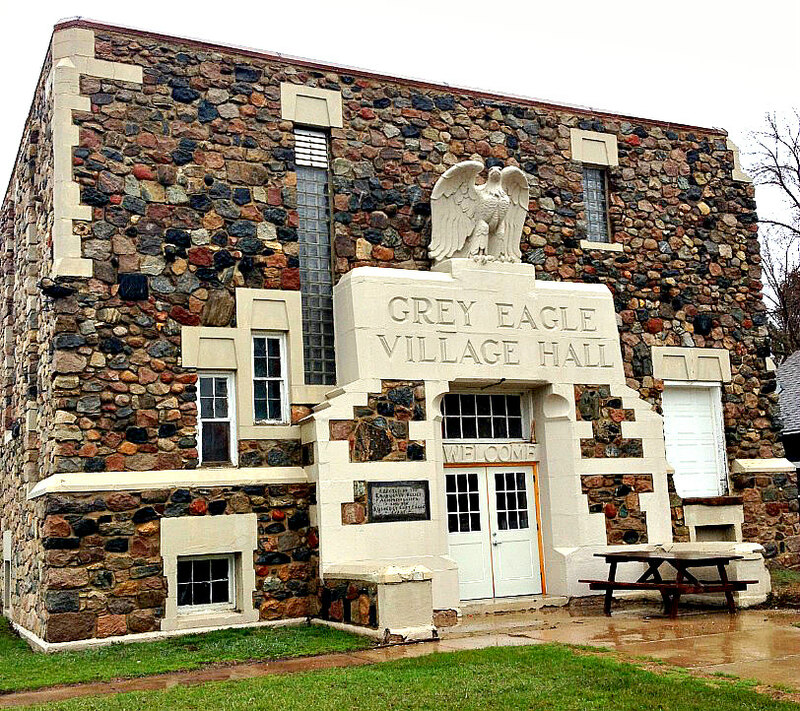 While in the area: Grey Eagle is located near many of the beautiful Churches of Stearns County, and close to the town of Sauk Centre, home to the historic and haunted Palmer House Hotel. Love seeing this page ! I hope to get back into doing history again myself on Todd County . I have a story about a little town that used to be between Burtrum & Grey Eagle Cogel Siding , I think it was called . Mom, in 2 short months the first anniversary of losing you will be here. I wish I had learned your history projects and your research methods. You had so much time invested in the history of this area and of the people who built this area into one of the best places for a child to grow. There were so many great people who made this community awesome for a very long time. I can’t begin to explain the overwhelming sensations of pride and honor I get because of you, Gene and Ginny, all of our relatives and ancestress, of course all the hard working men and women who built this community into a very special place. I grew up in the gardens with you, learning everything I possibly could, all the time on the farm, milking cows, throwing hay bales, helping Uncle Gene fix machinery, I couldn’t of dreamed of a better childhood. Our family had our hard times, yours and dad’s divorce was hard but I always knew that everything you did was for protecting us kids, making a better life for us kids, teaching us the values of an honest hard days work, helping those in need and making life as fun and enjoyable as possible regardless the circumstances. Life didn’t work out as planned for me and i know there were times I caused you great heartache and disappointment. I am doing the best I can each day, I have 4 amazing beautiful kids who love and miss you as I do. Someday I will make you proud once again, I have so many ideas and plans that I believe will help our community’s strength and compassions grow. I’m from one of the most amazing families in this area, all the time I spent learning from you, learning from Gene and Ginny, learning from Gary and Laurie. The list of friends neighbors and family goes on and on. I would not be the man I am today if you and dad decided to move to our clay hills and raise us kids to honor, love, and support everyone we knew from the awesome Burtrum Grey Eagle area. I wish I had spent more time working with you on your history. It truly is an honor and it makes me so proud that I get to call you mom! You really are one of the Good Lords best creations. I can’t begin to describe in detail exactly how amazing it was and how awesome it was too have the best mom possible. I love you so much mom, if I could just spend one more day out in the garden with you I would die completely happy. Please mom, give our love to everyone whose already there. God Bless you all! Until we’re all together again I love you mom!